Utah’s Green River, below Flaming Gorge Reservoir, is one of the finest trout waters in the United States. The river consists of a trout population averaging 6000-8000 fish per mile. It flows through a deep beautiful canyon which walls rise from the banks over three hundred feet strait up in many areas. Large brown, rainbow, cutthroat and hybrid trout all flourish in this big tail-water fishery. The Green River begins its journey at Flaming Gorge Dam, which is a spectacular site in its self. The dam is approximately three hundred feet high making the parked cars below look like a view from an airplane. Below the dam, the river flows through Red Canyon and can be broken up into three sections. Flaming Gorge Dam to Little Hole (section A), Little Hole to Indian Crossings (section B), and Indian Crossings to Riverside (section C). From the dam down stream 7 miles to the Little Hole valley, this length flows through a 1000 to 2000 foot deep canyon rimmed with magnificent red walls. The upper four miles is generally flat deep water with several shallow feeding grounds, making it ideal for those that are wading. There are several minor rapids interspersed throughout this slower area. The lower three miles are mostly fast water creating very good pocket water style of fishing. This section is excellent streamer and large attractor fishing. Plenty of shallows for wade fishing abound throughout the fast water. There are a total of nine named rapids which you will need care on picking your way through, however none are large or dangerous if caution is observed. “Section A” which is seven and a half miles from Flaming Gorge Dam to Little Hole is the most popular stretch of river. It is the easiest section to access and has the best population of trout. Most people choose to float this section in either a drift boat or raft because of the access. There is a walking path that traverses the river in this section as well which many people use to walk the north bank of the river. Rainbows, browns, cutthroats and hybrids are all in good numbers throughout this area. The area consists of swift deep pools broken up by fast moving riffles and runs. The water in the upper stretch of river generally runs “gin-clear” even after hard rains. A bit more open terrain although it too goes through some canyons. The river has several wide flats here giving wade fishermen additional area to ply their trade. Hatches start on this stretch in general a bit earlier then in the Canyon and they are also heavier. The only road approach to this area is either at Little Hole or from the bottom in Browns Park, making it a bit more difficult for access to certain areas. Red Creek Rapids, half way down is the only rapid one need be aware of. It is a class three (very rocky) rapid. When the water is high it is no problem if taken on the left side. At low water one must be careful with all the rocks showing. The bottom four miles below Red Creek are mostly flat water but great for streamers and hoppers. Very good insect hatches can make this water come alive. “Section B” is also a productive stretch of river with more brown trout then any other. The browns also average larger in size below Little Hole and get much less pressure then the trout in “section A”. The float from Little Hole to Indian Crossings can be exceptional except after hard rains. After these rains Red Creek, which flows in about midway between the two access points, can make the Green River very off color from dark colored sediment. It may take a few days for the lower half of this stretch to clear after hard rains. This area contains more slow flat pools then the stretch above Little Hole although a serious stretch of rapids makes for an interesting float. A very easy rapid to get you started. Either high water or low it doesn’t change much. It is a straight chute right down the middle with rollers in it. The only rock to watch is on the right at the bottom of the chute but the flow of the rapid does not push your boat at it so there is little chance of knocking the rock unless you are literally not paying attention. A bit more formidable to negotiate, but if you’re observant it too is not taxing. There are no significant waves, simply a few rocks you must be wary of. By far the easy route is the right. Left passage requires skillful rowing to get thru it. The main obstruction is a very large rock right in the middle of an already narrow chute. The large rock is named “Little Steamboat” after the famous Steamboat Rock on the Green down in Dinosaur at the end of Canyon of Ladore. Again, this is not a difficult rapid, but it is one that has sunk may boats and even drowned a few people. All because they most likely were not watching where their boat was drifting and was swept under the large Steamboat. It is a very simple maneuver to row your boat to the right of the rock and drift on by. like the previous two it is a short rapid. This one has a drop of about 4 feet. On the extreme right there is a tongue of water that spills down. You must position your boat to the tongue and let it sweep you down and through. It is easier than it looks. There are rocks on the left of the chute and also to the shore plus a more substantial rock on the right, but that is the only way down it. At high water one can go anywhere over the drop but your boat will do some bucking, and if taken center you will surely eat some waves. Just over two miles down from the boat ramp at the Dam, this is the largest so far. It also is fairly narrow and has rocks coming out on both sides that need to be watched. There are several fun waves but still not big as some rapids go. Definitely not a rapid to worry about. This rapid is approached right down the center and stay in the center all the way. Again there is a smooth tongue that you will let your boat drift and it will take you right where you want to be all the way through. It is a good idea to keep your oars going at all time with short strokes always against the current to keep your boat under control. At the end of the tongue you will hit the first wave, just keep the boat straight. Near the end of the rapid you will hit a series of roller coaster waves. This is a fun rapid that does not require much maneuvering skill, so have fun. This starts right at the 3 mile marker at the bottom of Lake Bonneville, which is sometimes called the “turn-around hole”. Not really a rapid but a riffle that is quite shallow at low water. Until the flow gets over 1200 there is a line of rocks at the bottom that will need some negotiating to get through. The easiest path is on the far left. You can get through anywhere but be ready to do some rowing and dodging. There will be quite a few people wade fishing this riffle so be respectful of their water. You can row anywhere and it is a wider riffle than most. There are a fair number of rocks interspersed down this rapid but again with a bit of maneuvering it should not be hard. The easiest start is middle left and stay near the center, about half way down there is a wide underwater rock that is a good spot to start rowing behind it to get away from a prominent rock below in the center of the river. To the right of that prominent rock is a ledge that is to shallow in low water and your boat will bang a few there for sure. It is recommended to stay to the left side and you will ride the rapid out fairly easy. This rapid is the first so far that is on a bend in the river. It takes a right hand turn. Long as the Green’s rapids go. It is straight and medium wide, with rocks scattered throughout. Start down the middle, split some prominent boulders then gradually navigate left around some partially submerged rocks that are on the right side. At that point it is easier to go to the middle and pass right of some rocks coming out on the left (Be aware of many large underwater rocks right at surface level). From here down which is about half way you can actually go anywhere. There are scattered boulders on all sides that you will have to row away from. Staying in the middle will work fine, just watch all the rocks and make your decision as to which side of each rock you wish to go so to keep you safely out of trouble. There is a sign on the right side of the river in the pool between Skinny-Dip and Mother in Law for you to recognize this rapid. It is the second rapid that is on a right hand turn in the canyon. Actually this one first curves to the left then radically back to the right against a cliff face that warrants your attention. Every year early in the season when the run-off moisture affects the rocks along the canyon wall, we have a few falling rocks off the cliff that can alter sections of the river. Such a one occurred about 1994 to Mother in Law rapid. We had a major rock-fall that changed the bottom end of this rapid and made it more difficult. Initially it is best to start into this rapid center or on the far right. Then cut to the left or stay on the rollers in the middle until nearing a prominent new boulder which is situated on the right side of center, near the bottom curve. There are two pillow rocks that is best to split then row always against the fast current sliding to the right and out a narrow gap in the rocks to the right. 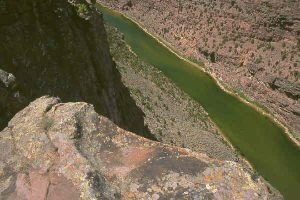 It use to be that one could row right down the cliff edge just being careful not to get swept into it, but the rock-fall has cut off this route and blocks the entire left side of the river at the bottom necessitating the exit on the right chute. The large rock on the right at the bottom is a boat-eater of the first magnitude. As I right this there is a canoe wrapped around it, and there will be around twenty boats and raft eaten by it this summer as there is every year. This is not as hard as I’ve made it sound. If you keep the oars in the water and keep short controlling strokes you will be able to keep your position and be able to go where you want to. The definition of Pillow rocks is “underwater rocks that are hitable but unseen. Unseen due to slight white water disturbance”. Deadman is at the mile marker 5. It starts with a boulder field that is best taken right down the middle. It will require maneuvering. It is shallow so always keep your boat facing straight down stream, except while hard maneuvering around rocks. (When approaching a very shallow spot or rock never let your boat hit it on the chine or side. Always swing you boat so the front hits the obstruction. ) half way through Deadman the gradient changes and you start to move faster. There is a large boulder in the middle at the bottom to be careful of. It is the Deadman boulder. Best to go to the right of it, watch out for a small rock on the right just above the Deadman boulder. You can’t see it but you will hit if in shallow flows if you try to pull to far right. It is actually best to just miss the deadman boulder, because of existing currents. When you wash out into the pool below the boulder there is another Rock that it is easiest to row to the left of. The Rock Garden is aptly named. A true riffle about 3/4 of a mile long with many large boulders. It is quite easy to row through the entire thing but the top end is easiest center then to the right. At the bottom either right or left is good. A row of large boulders are down the middle. The Rock Garden goes right into Dripping Springs. At low water (800 CfS to 1000 CFS) this is the smallest rapid on the A section. At high water starting at 3000 CFS this is the largest waves on the A section. You can’t see the waves until you get into it so if you are not confident with your ability don’t go down the middle. Stay to the right. Several boats have been lost because they didn’t make it up to the crest of the wave and slid back into the bottom of the swell until a wave broke over and flooded the boat. This is a fun one at high water just be careful. At extreme high water the actual waves diminish again but watch out for waves in the pool below. This one got it’s name because the route through it is like going through a can of worms. The whole right side of this rapid in low water is to shallow, so you would be banging off rocks constantly. The left is the side to go as you approach midway and the bottom. The top you may go in from center to left but you will have to row around some good-sized rocks (Easy) . At the bottom there is a slight drop and I find it easier to slide out to the right or center right. The left side, at the bottom, is loaded with underwater and pillow rocks. Not dangerous but everybody along the river will here you coming. The cat-walk is a reef that angles down from Coney island on the left, down to the grassy bank on the right side of the river. It goes from bank to bank and there is only two places to sneak a boat across it without banging the bottom. The best is a small tongue of water center-left and it fades toward the left bank as you glide across the reef. Always keep your boat straight down stream when you start across the reef. The second place to try to get through is right on the left bank. At 800 CFS you will more than likely hit some rocks but you are moving very slow so it will not have any affect on your boat. This synopsis only pertains to low water from 800 cfs to 1000 cfs. This is an old road bed that stretches the entire width of the river. Just above the ramp # 1 at little hole. It is best to take this center left sliding in to the left straight towards the boat ramp. Very shallow so a straight boat is necessary. You can even walk your boat in if you wish, just don’t get caught by the wash right at the ramp that will send you down through the chute to the second boat ramp on the other side of the revetment. A simple chute that is straight thru. A couple of large rocks on the right, but they are not any problem at all. The only time you might get near them is if you are fishing the right side and working close in. Even then they are easy to avoid. They water is deep enough at all levels so there is no problem what so ever. This is right in front of Cottonwood camp. It is a shallow riffle that should be taken right in the middle. The right side is very shallow at low water, with numerous rocks just above the surface. Another very easy one. either side of the island. They are shallow but very easy to see where you want to go. At low water the left hand channel is very shallow to the left, but can be rowed on the right side of the channel. That’s at the top of the island. At the bottom of the island at low water you need to go out the right side of the riffle. On the Right channel it is easier and deeper. The only area to watch is at the bottom of the island and stay slightly to the right side against the bank. Going into Joe’s Hole this is another chute you want to stay in the middle. There are some boulders on the left that are hittable and if you go to far to the right you can hit some. This riffle curves near the bottom as you come out of it and it is a very shallow shelf. (Only at low water) Stay in the middle and you will not have problems, but keep your boat fairly straight to guard your chine. Washboard is fairly long. It begins right at Big Pine camp. There are numerous rocks you must dodge while rowing this rapid. Stay in the middle of this rapid until you have rowed it several times, then you will learn where you can negotiate the rocks. It is a great fishing riffle but requires much dodging if you are going to try fishing the edges as you float through. Near the bottom at shallow water you must move to the right to slip out the bottom. At high water you can go through anywhere but will still require some rock dodging. After coming out of Washboard Rapids you move into the long lake-like pool called Pugmire Pocket. Three quarters of the way through this slow water you will spy a sign on the left side that cautions you to Red Creek Rapids. At the top of Red Creek you should pull over on the left on a gravel bar and go scout the rapid. It is the most difficult on the Green below Flaming Gorge dam and down to Canyon of Ladore. Beginners should try this one on the left. It is a shallow very rocky channel but it will not endanger your boat. Although you will probably hit some rocks your boat will still slide over them. At low water it is suggested that one person row the boat through so that it will be lighter. If you are an experienced boatman you could row the right channel. It is much harder and faster, and there is a much better chance of losing a boat. At the start there is a drop that tries to take your boat straight into the cliff. You can follow that but keep your boat from hitting the cliff by rowing hard backwards. There are three big sleeper rocks right in the middle of the chute you must stay off of or they will spin your boat. Actually I like to cut left right at the drop and slide left of the Sleeper rocks. At the bottom of this chute there are a series of boulders we call the Dragon’s Tooth that are dangerously close together and needs some fine rowing to sneak through. You can go right against the cliff, there is room or you can slide out a slot on the far left and end up in the left channel of the rapid. After 100 feet the channels come back together and from that point collect your partners (on the left shore) and ride out the rest of the rapid together. From that point work your way across the rapid to the right at a cliff face and ride the next portion of the rapid along that right side. You will have to negotiate quite a few rocks, however the rapid is not moving fast so you will be able to do it fairly easy. When nearing the bottom there is a reef across the river, take it right in the middle sliding back to the left side of the river. The current naturally takes you over there. From the reef there is a chute about 100 feet long but only one rock in the middle to be careful of and that is it. (Warning) At high water always take the left channel at the top. The right side against the cliff will be a mix-master with some high sharp waves. This is right after Red Creek camp. A very easy rapid with the only waves at the bottom as you slide into the pool. This is a curving rapid to the left, and should be taken right down the middle. Near the bottom there are a series of flat boulders mostly on the right side. Easily missed just watch for them. a very short chute next to a small island. The only thing to watch for is a large boulder the water spills over on the right side. Stay to the left of the wave on the boulder. At low water you can take the chute on the left but mind the rocks on the left of the channel. It is very easy to go the right side of the island and go out the middle channel. You can only go the far right channel at the bottom in high water. There two islands together and three channels. Most people row the faster left chute, but the middle is the easiest. This is almost exactly like the last rapids. It is at the bottom of a spot on the river we call long lake. There are two islands and three chutes. The one on the left is shallow going into it but then deepens and is very easy. The middle is easy. The far right is to shallow unless it is high water. is a reef that was man made to divert some canal water back in the late 1800’s. At low water there are two ways through the reef, the first being at the top right, easy to spot and it is a deep channel. The second is most of the way down the reef on the left of the river. It is marked by the biggest rock along the reef. It is shallower then the first but can still be negotiated at all levels of the river. The rest of the riffle is on a left hand curve and should be taken more on the right, but again watch out for some rocks sticking up near the bottom. These rock aren’t prominent but hittable. The last riffle before Indian Crossing. At the bottom of a series of islands you get a fast chute of water. There is nothing to hit until the bottom of the island where a large reef is on the entire left side of the river. At the bottom hug the island on the right and follow it’s curve to the right then back left minding a rock on the right of the river at the bottom. When you come out of this riffle Indian Crossing is in sight about 300 yards down river. There are more miles (12) in this section which snakes through the high desert valley of Browns Park. Due to it’s wide open features, other then several canyons it has cut through, it seem there is more flat water here then the upper two stretches. You will find extensive riffles holding many fine trout. Hatches are very good and they show earlier in the Park, however it is susceptible to wind which can destroy the day for the dry fly fisherman. Hopper fishing during the summer months is exciting and successful. One other tough feature of the Park is accessibility. Access once you are in the park is very decent, but the distance to the park on dirt roads and a steep canyon make it a bit tougher. “Section C” is the last area people fish in the region. This stretch, like “section B”, can be off color after hard rains because of Red Creek. It is a tremendous stretch when the water is clear. Large browns hold here and can offer excellent fishing when water conditions allow. There are not as many fish in this area but browns upwards of thirty inches have been caught here. This area is difficult to access unless you choose to float. The water in this lower stretch is much slower then the water in the upper reaches below the dam. There are many riffles on this section but most of them can be taken anywhere. If rock are struck there will be no damage. Just below Pipeline Access there is a small series of sandstone drops that create a small rapid. It is hard to tell if your boat will strike these shelves or not so it would be best to avoid them. The easiest way to do that is stay on the right side of these steps. At the bottom nearing the cliff on the right there is a large underwater rock that is easily seen and best avoided. Just slide out to the left around it and you are into the pool below heading into the false canyon or more correctly Little Swallow Canyon. From that point on there are only a couple more riffles that do not need mentioning. Hatches on the Green River include Blue-winged Olives, Tricos, Pale Morning Duns, caddis, and stoneflies. There are also many other insects especially cicadas and terrestrials like ants, beetles, and hoppers. Scuds and nymphs are also very productive and what many people fish religiously. Streamers and big woolly buggers can work well especially in the two lower stretches if the water is off color from Red Creek. If you come to the Green River, make sure to stop into one of the fly shops in the area. They will be able to tell you what sections of river are fishing the best. There a few Special Regulations as well. If rains have not been a problem, then the lower sections are nice to escape from the crowds. During the summer weekends, the river is a huge recreational attraction, but the trout do not seem to mind the commotion. Most people choose to fly into Salt Lake City and rent a car. It is a beautiful ride from Salt Lake to Flaming Gorge and the Green River. Make sure to bring along a camera to take pictures of this beautiful river and surrounding canyon. One astonishing feature of the Green River is shore-line accessibility. There is a short bank behind the Allen Ranch in Browns park which is marked with “No Trespassing Signs” Other than that brief inconsequential piece of shoreline the river is completely open to wading. The Green River is now in the clutches of winter’s cold air and lower water temperatures, but the fish are still biting. One of the more closely held secrets for many of us that live in the Mountain West is that January and February, most years, have more blue-sky sunshine days in them than there are days with miserable weather. So, while the rest of the country thinks we are bombarded by snow and cold, we know that there are considerable stretches of weather suitable for us to spend time doing a variety of outdoor activities, including fishing. Now I know many anglers who hang up their fishing rods in the fall not dreaming to fish until the next spring, some of them not even until summer arrives. But there are also those year-round die-hards that will fish under any conditions, anytime, anyplace out there somewhere. While we might like to change the minds about what a fishing season is to the first group, their absence does allow the second group lots of solitude when and wherever they fish. Hummm! Maybe I should not mention that! Oh well! The point I am trying to make: There are some great days and great fishing available this time of year. Take time to enjoy the shoulder seasons on the Green River when it is less pressured. One of the most consistent things about winter fishing is that overall fishing conditions change ever so slowly. So, at the risk of sounding repetitive, I am going to reiterate some of the more important information previously reported. First, locate the trout, then fish for them, don’t just fish the water. Wintering trout tend to group (pod) in areas that have slower velocity habitat and vacate those areas where their energy expenditures exceed their dietary intakes (i.e., heavy riffles or h4 pocket water). Next, nymph fishing will produce the majority of the fish caught; streamers may produce some great fishing and outstanding fish as well; dry flies can be fished when the right conditions pre- sent themselves (always be on the watch for some good winter midge or Baetis activity). Then, dress appropriately, think layered clothing that is easy to adjust. Finally and most importantly, have fun. Winter’s cold has finally gripped the Green River. But, as winters go, this one (2000) has been very dry, lacking significant moisture in the few snowfalls to date. In between the cold snaps and the few snowy days there have been some very nice winter days to fish on. The other day I travelled to Little Hole for a few hours of fishing. I didn’t walk far from the car and in a two-hour period caught and landed 10 nice trout, plus a few that caught and released me. Several were nice rainbows, one cut- throat and three brown trout of which one was 18 inches. The trout were midging on the surface everywhere you looked. During the time spent fishing, I was able to sight cast to a number of individual trout and half a dozen nice groups of feeding fish. This goes on all winter long. My approach was a small Griffiths gnat trailed by a small midge pupa. The Griffiths caught a few fish but was mainly an indicator for the smaller midge pupa. just a nice day to be out and about. Oh, did I mention that there was only one other angler on the river! When the air is cold or when the wind blows, I intend to throw a few more logs on the fire:, maybe even tie a few of my favorite flies. But when there are days as above, you might just find me on the river fishing, daydreaming, or maybe even just watching the trout rise. Even in winter, even if we can only escape for a few hours, the river is still a sanctuary! March On the Green River is a time of awakening. The shorter days of winter give way to longer ones that provide increasing periods of sunshine along the river corridor. Sure, winter can return at any moment, but it is this increase in light that stimulates the earliest movements of nature away from the grips of winter, in us humans as well as fish. This awakening is a reversal of what we experience in early winter when the trout become almost docile. Now the trout become more active in their feeding, almost aggressive after a winter’s rest. We even see the same aggressiveness within aquatic insects, with a species of winter caddis and slender winter stones joining the ever-pre- sent midges. Even a few terrestrials such as ants and small beetles will start to stir. Rainbow trout, too, will respond to their urges to reproduce and will visibly gather in some areas for the spawn. The river’s movement away from winter is a slow process and it begins in March, when there are still opportunities for solitude and great fishing. While the river is in change, nymph fishing will still be the most solid approach. There will be opportunities to fish with midge patterns on the surface for periods most days. But to take full advantage of the trout’s aggressiveness, my experience suggests that bright Scuds with Midge trailers produce the best overall success. That setup is especially good when targeting the larger trout that allow themselves to be seen by observant anglers. Some of the most effective patterns will be large Scuds in sizes 12 to 10. Good colors are orange, pink or tan. Some anglers prefer glo-bugs in the same colors, or simple midge pupas in sizes 16-18-20, in red, black, brown or olive. On the surface, try the classic Griffiths gnat in sizes 18-20. But watch for the large winter caddis (a blond colored size 10), or the slender winter stones (size 14 black flying ant matches it well). Don’t forget streamers-woolly buggers in sizes 2-4-6, black, olive, tan (ginger). Also try some in white. The popularity of fishing the Green River in April has grown steadily over the past four or five years. In fact, if the numbers of anglers present on the river any given day were counted as a vote, the shear numbers of anglers in late April and early May would definitely win any contest. So, should this be considered the best time of all to fish the river? If not, why are there so many anglers on the water? The answers to these questions are complex. As a fisherman myself, let me point out the most obvious. First, outstanding nymph fishing followed by great midge and Baetis hatches on the surface create superb fishing opportunities. Second, this period represents the first “best time” to trout fish after a long winter of cabin fever. Many of you might ask, “Ok, if the fishing is so good, aren’t there just too many people?” For some of you the answer is probably yes! If that is the case, try fishing on weekdays or early in the month, before everyone shows up. For the rest of you, when so many fish come to the surface to feed and they end up in your net, who cares if other anglers are around. You don’t see many people without smiles on their faces. After all, with the great trout population available to anglers on the Green River, you only need a small piece of the river to work over a lot of fish. Early season trout will take a variety of properly presented nymph patterns representing scuds, midges, Baetis emergers and other aquatic invertebrates that are present in the Green River. Sometimes entire days may be spent nymph-fishing when conditions do not favor surface hatches. On days when the surface hatches do occur, you still might need to nymph fish at least the early hours prior to the hatches. I prefer my scuds tied in larger sizes, #10-16, in bright colors such as orange, pink, and tan. These are presented as a single fly, or with a trailer such as a midge larva. Midge nymph patterns run all colors and sizes. One of my favorites is the simple brassie in sizes 18-22. Baetis emergers are active for several hours prior to their appearance on the river’s surface as duns. During this period they are very actively swimming in the river’s current and fall easy prey to the trout. Effective Baetis nymph patterns include the pheasant-tail nymph or WD40’s, tied in olive or grey, in size 16-18; the larger size is best early in the hatch. I also like to use these same flies in a “flashback” version. Flashy tinsel is used as a wing case to add brightness to the fly. This is very useful when the water has a slight stain or cast to it. Most good nymph fishing riggings will catch fish if you pay attention to fishing at the right depths of the water column, and work to get good dead drifts of your imitations to the trout. Adult midges emerge daily in the early season and can provide exceptional dry fly fishing. Trout that are midging are sometimes only noticeable by their smutting rises, so you will have to watch for them. I prefer simple, sparse adult midge patterns in grey, olive, tan, or black. Griffith’s gnat, fuzz ball, or parachute Adams, in sizes 18-24, are all productive patterns during midge hatches. Baetis prefer the cloudy, overcast, cool, even snowy days, but it’s not uncommon to find them even on a bright, sunny day. Duns generally start appearing around mid-morning and can fade quickly by 2 to 4 p.m. Parachute Adams and other low profile flies are my favorites, in olive or grey color; 16- 20 are the most effective sizes. Effective approaches to fishing these patterns are varied. I prefer to use an upstream cast approach, but in some instances on the Green River, feeding it downstream to a rising trout works very well, indeed. Whatever your approach, Green River trout are experts at detecting the drag on your flies, so working at your presentation will be key to success. One thing I try to pass on to my audience is the importance of terrestrials in effectively fishing the Green River. Sure, the Baetis and midge hatches are still important in May. They will continue to provide some of the best top-water action around until the air temperature climbs significantly. Additionally, there is decent activity from several species of caddis, from the spillway by the dam all the way down to Browns Park, coinciding with all the other aquatic insect activity. But it’s the blooming terrestrial base that provides an ever-increasing food source for trout just when their metabolic rates increase because of rising water temperatures. The presence of these land-based insects presents the first real opportunities to fish larger flies, getting away from the tiny imitations that are so synonymous with fishing during the midge- and Baetis-only portion of the season. This variety starts simple enough, with ants, beetles, baby hoppers and crickets, and ends with the most exciting megaterrestrial of all, the cicada. It’s hard to say whether the trout tire of being caught on Baetis and midge imitations and begin looking for some variety. But they definitely welcome the new, more meaty flies such as Chernobyl ants and the myriad possible cicada patterns that exist. Now, if you are bothered by the idea of fishing large attractor patterns in the midst of the smaller hatches, keep in mind that a large dry and a dropper nymph is a deadly spring combo. What you may be surprised to find though is how many of the trout go for the larger fly. In fact, on many days I remove the dropper because the trout are aggressively going after the larger terrestrial. So, when you struggle to catch Green River trout, or encounter that sly old brown that is ignoring everything else, remember they really do love terrestrials. Of all the terrestrials that are important for the Green River, it is the cicada that has been publicized the most. If you can imagine very large trout aggressively eating large flies in size 10, eight and even six in long-shanked hook versions, then you have an idea of what it is like. Over the years the cicada hatch has favored us well one year only to barely exist on another. This inconsistency is hard to understand if you don’t consider the bug’s lifecycle. Even then, it is not fully predictable. The most common species is about an inch to an inch-and- a-half long, shiny black with orange to yellow highlights, lives as a nymph underground for three to five years before becoming a winged adult, then lives as an adult for around 30 days as it mates, lays its eggs and dies. Its emergence, as a general rule, is close to mid-May but can be slightly earlier or later; numbers peak and taper off after the first part of June. It is because this insect is a very clumsy flyer that it sometimes finds its way onto the river’s surface, becoming food fare for the watchful trout. Contrary to common belief, it is rare to see huge numbers of these insects on the water on any given day. The trout must love them, for when even a few are on the water they seldom make a very long drift before being eaten. The last great year of cicadas was 1995, by my records. Like this spring, it was very dry early on. With a dry spring we may be headed for another peak year for cicadas. If the spring suddenly turns wet and cold again as in the past few years, it may be that we’ll only see a few hatch. Guess we will just have to let Mother Nature play her hand. But if the cicadas come to the Green River this season, you’ll definitely want to be there. The warmer season on the Green River begins in June each year when snow showers finally turn into spring rains and the average air temperatures climb into the 70-degree range each day. It is a beautiful time of year. All the trees and streamside vegetation bloom along the river corridor, and from the spillway to Browns Park the river is alive with activity. Wildlife is ever present. Fishermen enjoy the great opportunities available, imitating and fishing the multitude of insects the fish feed on. And last but not least, recreational rafters return to the river after most schools recess for summer vacation. The Flaming Gorge National Recreational Area offers a lot of recreational opportunities besides the Green River. The reservoir itself is a big attraction, with fishing, boating and water skiing. There are numerous campgrounds that open beginning Memorial Day weekend, or visitors might wish to try out one of the great local lodges this area Gas to offer. 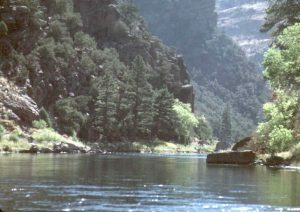 The river itself has a number of great float or hike-in camp- grounds below Little Hole. And, of course, the High Uinta Mountains provide myriad other recreational activities for visitors. But let’s get back to the Green River and its fishing. In my last report I gave some information on the megaterrestrial, the cicada. This spring has been the driest in the last five years, providing the best start to this hatch that we have seen since 1995. If the weather stays on its current course and we don’t get any that turns extremely cold, this may well be an above-average year or better for this hatch. The first of June will be the peak of the hatch, with a 30-day ramping down period, unless the early dry spring brings them on ahead of schedule. But either way, expect this hatch to effect the fishing long after the naturals have waned. As at tractor patterns, cicada imitations often work well into September and beyond. Along with these insects there will be a blooming hopper population and an abundance of other terrestrial insects such as beetles and ants. Anglers that ignore their presence will miss an important approach to fishing this river. Aquatic hatches will be important as well, but their strength and duration will not match the intensity of the midges and baetis hatches of the spring. Several species of caddis will be present and furnish some evening rises that are rare for most of the Green River’s year. Pale morning duns will also provide some great fishing around mid-June or later. These are fairly large mayflies for a tailwater fishery, starting early in the hatch as a size 14 and, like the baetis, they get smaller as the hatch progresses. Their numbers are h4er in the lower reaches of the river but are not uncommon in Red Canyon as well. They commonly hatch midmorning and can provide some great fishing in the middle of the day when fishing might otherwise be deemed slow. For those anglers who like to fish deep in the river, scuds and midge imitations will still work wonderfully. The cicada hatches in June were tremendous and the great fishing they stirred up should continue well into July and beyond. We do have the potential for the emergence of an even larger 13- or 15- year species of the cicadas to appear in July and August, which would cause even less-than-rabid fly fishers to drool. But even if they don’t arrive and June’s naturals fade from the river; cicada fly patterns will be extremely effective for some months to come as attractor-style flies. Add to that a full line of aquatic insect hatches and terrestrials and you have the recipe for the best fishing offered anywhere in the Western states. Among the aquatic insects are caddis flies, pale morning duns, and craneflies later in the month. In the lower reaches of the river you can add callibatis, damsels and dragonflies. In addition to the cicada factor, the terrestrial base will be in full bloom: grasshoppers of every sort and color, beetles, ants, even the possibility of a visit to the river from the Mormon crickets that are said to be abundant this year all will combine to provide a great food base for a bulging Green River trout population. This is also a great time to fish your favorite attractor dry flies such as Royal Wulffs, humpies, stimulators and such. Notice I haven’t mentioned much about nymph fishing? Well, you can effectively do that year-round on the Green. In fact the dry/dropper technique works wonders most of the year, but summer is the time when the dry- fly approach really steps for- ward as the best and, for most of us, the preferred technique. But a cautionary note is in order as we settle into summer: July is also a busy month for our area in terms of recreational visitation. Flaming Gorge National Recreational Area attracts lots of vacationers to the reservoir, nearby mountains and Green River. Many of them end up on the river as rafters, which means that during your fishing trip here you will undoubtedly need to share the river with these folks. July also has two major holidays, the Fourth of July and Pioneer Day, a state holiday on the 24th. Both bring extra people to the river. I’m not saying that you should not visit or fish the river during those time frames, but if you do, keep your expectations in line with the reality that there will be plenty of folks around. On a personal note, this report is an anniversary for me of sorts. It was one year ago this issue that I submitted my first Green River report for Utah Outdoors. It has been lots of fun and I have made many new friends in this effort. Thanks for the wonderful response I have received from you, the readers, and the great support of the Utah Outdoors staff. Hope we can keep meeting right here for many years to come! What a difference a year makes! Last August we had just come down from near-record high river flows. This year (2000) we are in a state of drought and having very low flows. The average flow per day is lower than we have seen on the river for more than eight seasons, at 1300 cubic feet per second (cfs ) compared to our normal 1700 to 1800 cfs for August. We are seeing, in essence, the basement of the river this season. At this level it’s easier for the walking anglers to wade the river and harder for the floaters in some areas to dodge rocks. Floaters should especially use extra caution in Red Creek Rapids. It is a bone pile of rocks at low flows and should be scouted for safe passage. But even with this change in flows, the river still fishes well. This is a great time to fish your favorite attractor -style flies such as humpies, Wulffs, stimulators, etc. There will be several aquatic hatches to watch for as well. Caddis will be very active in the evening hours. Pale Morning Dun mayflies will also be pre- sent many days. Emerging craneflies will be active in the wee morning hours. As in all warmer months, I can’t overemphasize the importance of the Green River’s terrestrials to successful fishing. This is probably the prime month for hopper fishing and on a slow day or when encountering that fussy big brown trout that refuses all else, a black ant (#14/16) or beetle pattern in the same sizes can work magic. This spring we had possibly the all-time best ever cicada hatch in May and early June. Though the naturals are gone now, you can still have great fishing success using cicada patterns as an at tractor fly. These and other large dry flies also work well with droppers below them. Here are a few pointers on why and how I approach fishing dry/dropper combos. This technique is deadly effective because it allows you to fish a dry and a nymph at the same time, thereby appealing to a broader range of feeding trout. The flies are connected by first tying a tippet to the hook bend on the dry fly. Then the nymph is tied onto the tippet’s other end. The flies I use for the droppers typically have metal beads placed at their heads before they are tied to help them sink. Tungsten beads are the most effective. The dry fly needs to be able to support the weight of the dropper fly so that only a tug from a fish will sink it. The dry fly thereby becomes your strike indicator. Bead head nymphs, as they are known, can be tied in a number of standard pat terns such as pheasant tail nymphs and a number of midge patterns. In setting the depth for the dropper (length of the tippet), I key on several things. First, the deepest I ever fish this way is under three feet (generally around 30 inches or less). If the tippet is longer it becomes hard to cast with- out tangles. If you need to reach a greater depth then go to a standard nymph rig. Early in the day I fish at 24-30 inches because the fish are generally staying tighter to the bottom. Then I fish sections of river water that match up well with the depth I have set. As the day passes I find you can shorten (up to 12 to 18 inches) as the fish move up in the water column and become more active. I will go shorter than that (as close as four inches) when I observe fish feeding at those levels. If they are cruising and feeding at six inches, then set it at six. This requires watching for the fish and their activity from pool to pool and from morning into afternoon and making adjustments when necessary. Use this technique whenever you need to buoy a fly at a certain level in the river to keep it near the fish’s feeding level. September gives visiting anglers the best the Green River has to offer. Beautiful fall colors will adorn the mountain and riverside vegetation, optimal river conditions and fishing that will be good enough to please most any angle, are just a few of the highlights. Fall Baetis and midge adults will return when the heat of the summer fades to cooler fall weather. These aquatic hatches along with caddis and a plentitude of terrestrials will mean that the river has a full plate of food to offer the trout and an abundance of angling opportunities for visitors. All techniques will catch fish at this time of year. But especially nice (because water temperatures are controlled through the Flaming Gorge dam) the opportunities to dry fly fish for rainbow and brown trout will continue through much of the fall. Fall brown trout will be working aggressively to gain as much weight as they can before the spawning season in November and December, making them especially venerable. Fly pattern selection can vary as widely as from midges to Chernobyl Ants, but attractor flies such as Stimulators and various Trudes are also a great approach to angling success. Though the numbers of visitors to the river stays high into mid September, their makeup is different when compared to other river users encountered during the summer months. Except for weekends, most of the rafters are gone after Labor Day weekend (most schools will be back in session by then) leaving the group that remains comprised mostly of serious anglers. While I have learned to accept other river user groups on the river through the years, it is nice to have the bustle and noise associated with them finally fade. One word of warning about possibly the most all around ideal month on the Green River, it is fast approaching the time when the weather can turn to the first signs of winter, be sure you are prepared for all the possibilities. Then all that is left to do is to just be prepared to catch lots of fish. I have to say that October on the Green River is one of my personal favorite times of year for several reasons. The foremost is a selfish one; with a busy year behind me I can finally get out on the river and do some fishing myself. But there are other good reasons as well. The mountains are full of color, river flows are stable, brown trout are aggressively preparing for the fall spawn and fishing overall is solid. A big plus is that there is less river traffic than other times of year, especially on the weekdays. The rafters are nearly gone with school back in session and the weather being cooler. But why anglers start turning away from the river is hard to discern. It could be that the big game and waterfowl seasons occupy many outdoorsman, but the end of predictable weather surely is a factor as well. Some folks just don’t care for fishing in cold or snowy weather. So it is well to remind everyone that October has more bluebird days than fowl weather days. So how should one be prepared for the weather in October? One of my favorite quotes is from a former guest who stated that he was “packing as if going to the beach or might go snow skiing too.” That sums it up, layer your clothing. How does the weather in October affect the fish catching? Not much! Remember that air temperatures effect fishermen more than fish. One of the unique aspects of the Flaming Gorge tailwater is the “selective withdrawal” system attached to the dam that allows the operators to effectively control water temperature releases through the spillway. With water temperatures still warm in the reservoir, the river releases will sometimes not drop below 50 degrees until early November. With river water temperatures staying high, the fish remain active later into the year than on most other rivers. The benefit for anglers from the temperature extension is that dry fly fishing remains a productive approach later into the season. There are midge and fall Baetis hatches. The caddis will still have a strong presence with multiple species present and the terrestrial base will still impact fishing opportunities until the first big frost hits the river corridor. Of course, nymph fishing is always an excellent approach anytime of year that you fish the river and the streamer fishing should be solid at times also. So, don’t put off your late season visit to the Green because you think it is to late; remember that this is a year-round river for more than just a few reasons. There is one question I’m frequently asked about the Green River: “when can we come when the fishing is great and there are no crowds?” I should first state that the best fishing and large crowds often go hand in hand. But, there are two periods of the year that could be an answer to this question: late fall/early winter (November/December) and early spring (March/early April). These are what we call the “shoulder seasons” on the Green, when overall river visitation is very low and the fishing still offers some great opportunities. I’m sure that hunting seasons draw some anglers away from the stream. Later the winter sports take their toll as well. But, for those anglers willing and hardy enough to endure the sometimes winter weather, there is still a great deal of fishing that can be done yet! In preparation, proper clothing allows you to maintain a good attitude and helps insure that you can safely endure even the most diverse weather situations. To deal with every weather possibility, bring layered clothing to supplement your wet weather gear. That said, there are also many colder season days ahead when the weather will be nothing short of glorious for fishing! Sunny and warm early November weather can extend the regular season approaches to fishing the Green. If that occurs, approach the river as usual. But when the weather gets consistently cold or wet, the fishing will shift into the winter mode. Winter is a time when trout often use different habitats than they do in warmer times of the year. This transition will occur as the water temperatures drop. It is generally first apparent when the trout become noticeably less visible along the rivers banks. They often retreat to the deeper and more sheltered/structured areas of the river to conserve energy. Anglers should respond to this in two ways: First, its time to start thinking about fishing deep with the scud and midge imitations that make up 80% of the trout’s winter diet. Second, spend some time to locate the areas that hold the largest concentrations of trout. My typical winter approach is to fish to the fish, not just fish the water. So, locate the trout first and don’t just fish blindly in the areas you’ve fished before. It just may be that the trout have moved out of the pool or areas that produced the best fishing for you this season. Remember, the reason for these changes are to conserve energy so more trout will be found in the slower velocity water and fewer will be available in the fast heavy river sections. Closer to the dam the fish are either deep in the runs or suspended in the eddies. The deep fish will have to be fished with scuds and midge nymphs to be productive. The eddie fish can be caught by suspending nymphs at 5 to 6 feet with an indicator or waiting/watching for them to work the surface. Near Little Hole, watch for midging activity by the trout -they will only be found in a few areas. Locating these trout may be your best opportunity to surface fish. Typical nymphing will take those trout that are in the riffles in this area. Have a good time fishing this winter! Winter on the Green River is a time when the fish get a break from the fishing pressure that they live with for much of the year. During most of the day the sunlight plays hide and seek through the canyon sections of the river, making it very cool wherever the sun doesn’t touch. So visitors need to be prepared mentally and physically for whatever conditions or weather Mother Nature deals them. The sunniest area throughout the day is around Little Hole. Consequently, most of the midges and winter Baetis hatches occur there, but it collects the most anglers as well. If the weekend weather forecast calls for warm and sunny, there will always be a few hardy anglers about. Skiers from the nearby resorts in Utah and Colorado often take a break from their skiing vacations to take in a little winter fishing as well. But in contrast to the river’s other seasons, this is a quiet time of year. The brown trout continue their spawning activity well into January most years; some of the really “big” fish expose themselves and are often more vulnerable than normal during this time. Nymph and streamer fishing are the most effective ways to approach the river, but anglers should always be on watch for those small pockets of midging fish. Their subtle rises will announce the few best opportunities to surface- fish small sparse midge patterns in olive, black or grey. For nymph fishing, I prefer to fish large, brightly weighted scuds with midge trailers. Pink and orange are my two favorite colors and have great attractor qualities. I fish them as large as size eight but no smaller than size fourteen. Other anglers prefer using Glo-bugs in the same colors but often add chartreuse to the arsenal. For midge trailers, I use a number of patterns ranging from Brassies to WD 40s in the smaller sizes ranging between 18 and 22. If I was to single out one important tip for fishing during the winter period it would be to locate the fish before spending time fishing the river. The fish will tend to “pod” in certain areas and vacate others. So, locating fish should be your first priority when reaching the river. Then, just have fun!